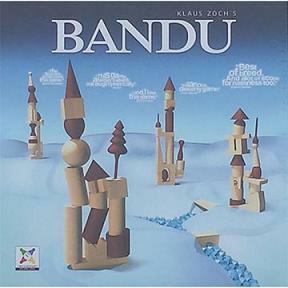 Bandu is a classic in tactical competence games. Four rules variations are included with the game, with the aim of all four being to build a tower. The sack contains different wooden pieces (e.g. egg, ring, pine tree, quad) as well as a small bag of jewels for the auction variation of the game. One might end up paying many jewels to avoid building an especially difficult element. Gambling and bluffing abilities are needed as well as building competence and strategic talent. A game with endless building possibilities, it`s a challenge for steady hands and shaky suspense for clever tactician.